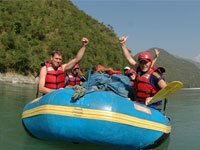 Since 1996, Nepal Experienced Adventure Treks (P.) Ltd. NEAT has been ensuring the excellent and the most personalized trekking services in Nepal. 18 years of experience in tourism now, we are one of the most Experienced Trekking Agency in Nepal. We have our expertise team who have already explored each and every corner of trekking trails in Nepal and can make your trekking, tours,peak climbing and expedition in Nepal a wonderful experience. We can arrange you the most flexible adventure holidays all over Nepal, Tibet, Bhutan and India according to your travel schedule. Being with NEAT makes your trekking in Nepal an easy through experience guidance. We are here to fulfill your zeal to trek in the majestic peaks and explore the Himalayas of Nepal. World's most popular trekking trails which guide to the world’s highest mountain i.e. Everest.